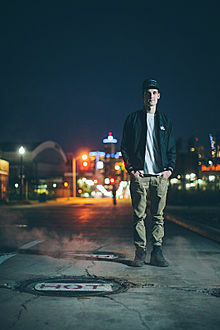 Grant Richard Kwiecinski, also known by his stage name GRiZ, is an American DJ and electronic producer from Michigan. He is known for playing the saxophone along with producing funk, electro-soul, and self-described future-funk. Kwiecinski was born and raised in Southfield, Michigan, a suburb of Detroit. In elementary school, Kwiecinski was first introduced to the alto sax as well as the piano. After growing up on big horn sounds of funk groups like The Meters, Kwiecinski found himself gravitating towards that influence when he first began making his own music in college. He attended Birmingham Groves High School and then Michigan State University for several years before he dropped out to focus on a music career. It was also during his college years that he had become personally comfortable enough to openly identify as gay. While at Michigan State he would frequently DJ parties at his friends' fraternity houses and play shows in the East Lansing area. GRiZ first became popular with the release of his free debut album, End of the World Party, in 2011. With the release, he ended up supporting bigger artists such as Bassnectar, Pretty Lights, Gramatik, and Big Gigantic on their respective tours, eventually leading to his own headlining tour. Following such success, GRiZ released five more albums, Mad Liberation in 2012, Rebel Era in 2013, Say It Loud in 2015, Good Will Prevail in 2016 and Ride Waves in 2019. Griz currently resides in the Denver, Colorado area. All his albums are available for free download on his website. 12 Days of Grizmas, an annual event hosted by Griz, is intended to generate attention and revenue for non-profits. During the twelve days leading up to his annual 2-day festival in Detroit called GRiZMAS, all proceeds generated from events are donated to a variety of charities, and fans are often rewarded for their participation. The GRiZFam started out as a way of fans of GRiZ to connect with one another through the music, pictures, and other associated art. Liberators are the essential street team for GRiZ, and help raise awareness for shows, spread the music, as well as help with charitable organizations. The combined groups of fans work by the mantra that GRiZ popularized: Show Love, Spread Love. In 2013, GRiZ made top reviews in publications such as Detroit Music Magazine, SPIN, and The Untz, who put GRiZ as the "#1 Breakout Artist of 2013." At the 2015 High Times Cannabis Cup in Denver, Colorado GRiZ won the People's Choice Flower category for the strain GRiZ Kush created in collaboration with Native Roots Apothecary.GRiZ creates new weed strain. In December 2015, GRiZ, The Liberators and All Good Records were awarded the 'Spirit of Detroit' for the 12 Days of GRiZMAS campaign that raised over $30,000 for Little Kids Rock. The initiative found the Boulder-based artist leading a 12-day series of charitable activities in his hometown, from collecting coats for the homeless and bringing supplies to dog shelters to spreading Christmas cheer throughout the economically depressed city via free shows, industry panels and a "Night Before GRiZMAS" benefit warehouse concert. ^ a b c d Thump Staff (2013). "GRiZ Is The Shiz". New York: Thump. ^ Brian McCollum, "Griz finds the funk in electronic music's future", Detroit Free Press, May 19, 2015. ^ Kwiecinski, Grant (2017-06-06). "My Name is GRiZ and..." Huffington Post. Retrieved 2017-06-06. ^ a b c Frazier (2013). "Detroit Music Producer GRiZ Bends Soul and Electronic Genres in the EDM World". Detroit: Huffington Post Detroit. ^ Kwiecinski (2013). "Liberated Music". Detroit: Griz Official Website. ^ Shepherd (2014). "12 Best Things We Saw at Electric Zoo 2014". New York: Rolling Stone. ^ Guarino (2012). "GRiZ – Mad Liberation (Album) : Must Hear Full Electro Soul / Dubstep / Future Funk Free Album". Boulder: ThisSongIsSick. ^ "[PREMIERE] GRiZ – Funk Party : Must Hear Future Funk Anthem". thissongissick.com. March 12, 2015. Retrieved 2015-03-13. ^ Kwiecinski (2015). "Home Page". Detroit: Griz Official Website. ^ Middleton, Ryan (December 15, 2015). "GRiZ On "Fantastic" Next Record, Sustaining All Good Records, Grizmas: Interview". Music Times. Retrieved December 17, 2015. ^ Moon (2013). "Team GRiZ Gives Back To The Community". New Orleans: Compose Yourself Mag. ^ Why (2014). "Interview: GRiZ". Detroit: Detroit Music Magazine. ^ Spin Staff (2014). "Holy Ship!!! 2014: Disclosure Crack a Few Smiles, and the 5 Best Things We Saw Friday". New York: SPIN. ^ Anand (2013). "Top 10 Breakout EDM Artists Winner". Philadelphia: The Untz. ^ "GRiZ Raises Over $30,000 for Children's Charity, Receives 'Spirit of Detroit' Award | Billboard". Billboard. Retrieved 2016-01-18. ^ Apple Music (2019). "Ride Waves by GRiZ on Apple Music". Apple.